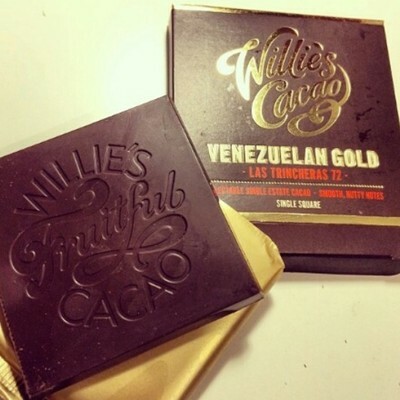 I have a thing for Willie's Cacao. I followed his televised journey, a few years ago, to find the best type of chocolate the world could offer. He is currently th only small UK producer of chocolate like this, and it turns out Venezuela, Peru Colombia, Madagascar and Indonesia produce the finest cocoa beans, or at least in Willie's opinion. I say his opinion, but in mine, the Venezuelan bars (£3.00) are damn good. The Venezuelan bar is made up of the Trinitario bean, which has an ever so slight fruity-yet nutty flavour. The fruity hit of chocolate is immeasurable, and has become top of my list for artisan chocolate. I am in lust with this chocolate because it is pure adulterated joy. Willie hasn’t tampered with the natural fruity flavour, or added unnecessary ingredients to appease the masses: he has found a niche and crafted something beautiful for those who appreciate the finer things in life. Willie only uses natural ingredients, which are helpfully listed on the back of the packet. A bar of Venezuelan Gold is made up of (72% cocoa solids), cocoa Mass, cocoa Butter, and cuban raw cane sugar. 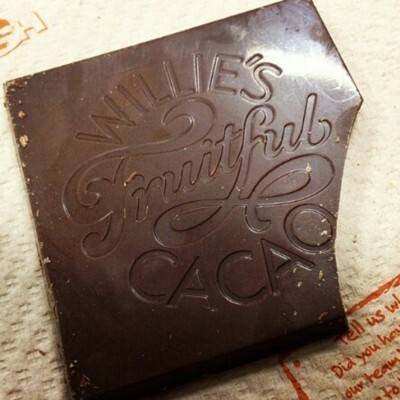 The standard of this chocolate is rare in the UK, which is why Willie's Cacao is so coveted by those in the know. Admittedly a bar of this calibre doesn’t come cheap and it certainly shouldn’t be considered a bar you grab in Waitrose, and munch after your lunch. It has been carefully produced, so I urge you savour every bite, or use it in a recipe for a special occasion. It's great to cook with, and with a high content of raw cacao, it makes a great gift for friends who are vegan, or trying a raw diet. Enjoying chocolate, no matter your intolerances/diet choices, has never been easier (or tastier). You can follow Willie and his hunt for better, tastier, and fairer chocolate via social media sites such as Facebook; his team regularly update their page with new finds and chocolate recipes. Find it in Waitrose, Selfridges, and online. The cheapest supermarket retailer is Waitrose.